The Wood River Ability Program is working to bring up to 20 disabled athletes to the Wood River Valley this winter to participate in a training camp and compete in the Boulder Mountain Tour. Program Director Marc Mast said his organization will hold a development camp for athletes who compete and perform at a high level but who are amputees or have traumatic brain injuries, birth defects, visual or auditory impairment or other physical limitations. Mast said the camp will start the week of Jan. 28, in conjunction with the 2013 Sun Valley Nordic Festival. The festival last year drew thousands of visitors, according to city occupancy reports, and nearly 1,000 registered participants—75 percent of whom were from out of the area. Mast said his camp would be “a lot of racing and a little training,” with athletes mostly coming to participate in the Nordic Festival. Athletes will compete in a three-kilometer race, a biathlon, sprint races in downtown Ketchum and the Boulder Mountain Tour. “I’m calling it a mini-World Cup,” he said with a laugh. In all competitions but the biathlon, attendees of Mast’s camp will compete alongside able-bodied athletes. The International Paralympic Committee Nordic Skiing World Cup wraps up in Cable, Wisc., on Jan. 21, only seven days before the date that Mast wants to start his camp. However, he said he hopes the timing will be helpful, as athletes from other parts of the nation and even the world may decide to head for Sun Valley after wrapping up in Wisconsin. “I don’t know, but it could happen,” he said. 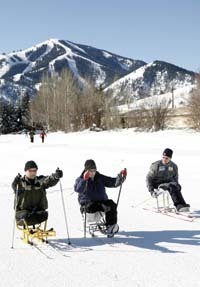 The camp follows the Wood River Ability Program and Sun Valley Ski Education Foundation’s success in obtaining designation for the Wood River Valley as a Nordic Paralympic/Olympic training site. The idea was generated by Mast three years ago after he attended a U.S. Olympic Committee Paralympics Leadership Conference. Mast—who contracts as a coach with the U.S. Paralympic Nordic team—said the idea was sparked when the topic of training sites was discussed at the conference. Mast said he contacted the Blaine County Recreation District, the Sun Valley Ski Education Foundation and the Ketchum-Sun Valley Chamber of Commerce to pull together an application. But after a few meetings, the idea languished—until Sustain Blaine economic development group Executive Director Harry Griffith contacted Mast and asked how he could help. A year later, the application was complete and designation was granted earlier this month. Mast said he wanted the designation partly to benefit the community as a whole through potential sponsors and branding, which could not only boost Nordic events but help bring more athletes to the area. Mast said that eventually, his goal is to host a Paralympic World Cup similar to the one being held in Wisconsin next year. Until then, he said, he’s focusing on getting at least five resident athletes from the U.S. Paralympic Nordic team in Sun Valley. So far one member of the team lives here—Omar Bermejo, a retired Marine who did four tours in Iraq and was convinced by Mast to come and live in Ketchum when they met at the 2010 Winter Paralympic Games. Mast said he’s trying to raise money to provide prizes for disabled athletes competing in the Boulder Mountain Tour. His goal is to raise $10,000 for athletes in six categories: men and women’s stand-up skiing, sit-down skiing and visually impaired skiing. If he’s successful, the Boulder Mountain Tour would be the first national race to provide prize money to both disabled and able-bodied athletes. “If we get prize money, we could get a lot of the current U.S. Paralympic Nordic Team here [to compete],” he said.